Square Dancing is an American folk custom. It was officially declared our National Folk Dance in 1982. It is also the official State Dance of 37 states, including Missouri. Square Dancing is not a spectator event, but rather a participation activity. It provides aerobic exercise and is also a social event. Exercising alone is not as much fun as a lively evening of Square Dancing with a group of happy, friendly people that also includes some refreshments. American Square Dance is different from other folk dances in that it is the only one directed by a caller, who creates patterns from already taught figures or calls. There is an infinite variety of patterns that can be used so no dance is the same as the others. Since there is no set pattern, new movements and calls are continually evolving. This constantly changing style keeps ever contemporary and enjoyable. This is the joy of Square Dancing: the stimulating variety of the movements, costumes, personalities of fellow dancers and the callers. The choice of music adds to the variety. Square Dancing is known as "Friendship Set To Music." 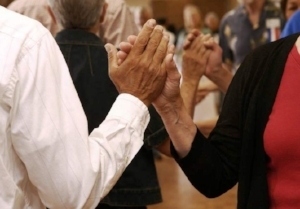 If you are a single, couple, weight-watcher, bereaved person, couch potato, exercise maven, homeschooler, youngster, oldster, person with two left feet... you should consider Square Dancing as a worthwhile addition to your lifestyle.